As an archiving solution for individuals, MailStore Home is a hidden gem, and one we’re guilty of not giving enough exposure here on the blog. So apologies for not mentioning it sooner folks – here’s a quick rundown of what it is, how it compares to the business version (MailStore Server), and why you might like to start using it. 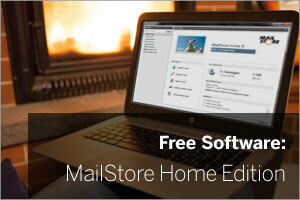 MailStore Home is a Windows-based software application for email archiving, intended for installation on either on a laptop or desktop machine. Once installed, MailStore connects to your mailboxes, takes a copy of all email and imports it into a secure database held locally on your machine. It does this whenever you decide to click to update via a handy desktop shortcut (scheduling is a perk of the paid version). There’s support for a whole range of different email sources and locations, so regardless of how you’re set up at home, you should be supported. A full list is available on MailStore’s web site. The main reason a lot of home users choose to use a product like MailStore is because even for their personal email, they’d rather not rely entirely on their mail provider to keep it safe and secure. By having a local copy of your mail stored safely in an encrypted archive, you’ve immediately got some peace of mind that another copy exists, but in addition, your messages are then muhc easier to back up to a USB hard disk (or other media) should you wish. The backup side of things is great for peace of mind, but day to day, one of the things I like most about MailStore home is just how fast you can find emails. I won’t mention the provider I use but it’s one of the big name hosts. The search is ok but it’s not quick and the options are quite basic in comparison to MailStore. Not only is MailStore fast, (results are returned instantly) but the searching more thorough. So if you’re like me and often only able to remember obscure references to the email you’re looking for – MailStore is great because it searches across the full message body, inside attachments and of course the usual header information, sender, date etc. 3) The answer to your email ‘hoarding’ ways! I don’t know if you’re guilty of holding on to way more mail than could ever be useful at work but it’s certainly not uncommon in my experience. Well, some of us have carried on the ‘hoarding’ at home too and this is where MailStore’s pruning feature comes into its own. Set your retention period and MailStore will clear out all email older than a specific age (we set ours to 12 months for example), which in addition to keeping your mailbox at a manageable size, may also help you keep within any data storage limits set by your Internet Service Provider (ISP). Now, the last thing I want to do is talk you out of looking at MailStore Home by listing all of the features it doesn’t have. However, it does happen to be one of the first things people ask me so I think it’s something you’ll find useful for me to cover. So don’t see these as negatives, more just as how it’s different from the paid version. It is! There are no ‘gotchas’, MailStore aren’t going to ask you to renew anything in the second year, to pay to unlock features, nor will they plague you with adverts or pop-ups in return for using their software. It’s completely free but of course, the aim of showing you how good they are at making software means you might just be tempted to try the business version too. So where can I download a copy? I hope you find MailStore Home a useful tool – by all means free to drop a comment if you’re impressed. Likewise, let us know (constructively) if you’re not! ← Why Can’t I Send Email When Using Certain Internet Connections?